In 2009 had the privilege to take in the production a documentary about the fighting around Fampoux and Rouex in the Battle of Arras. A long forgotten battle had it went on longer than it did it might had bled Britain dry of men, the casualty rate was about 4,500 per day. Filmed entirely on location in Britain, France and Belgium. "This tragic story, told for the very first time in history, examines a totally inexcusable tragedy and the failings of army commanders...1400 men from Scotland and South Africa of the brave 9th Division...fell in just 30 minutes, hundreds of them perished. Robin Thompson plays cleverly staged dual roles that reveal the shocking truths of April 12 1917." This clip contains shots from both Murder on the Hill and a Soldier's Return appears courtesy of Inspired Productions and Reality Entertainment. "My boyfriend loves war movies and documentaries, especially when they related to WWI. Although I must admit that I often lose interest, this documentary did keep me interested since there was a good blend of actors reenacting various scenes, genuine film segments, and footage from the present showing these historical locations. As mentioned before, since I'm not a big war fan, I didn't know as much about this First World War as I do now. When the DVD was over I had a clear understanding of who, what, when, where, why and how all of this took place. I felt saddened and infuriated after "witnessing" such atrocities. Though it's been almost a century since this happened, it doesn't make it any less horrific. In another part of this film the viewer sees and hears about the battles through soldiers' own viewpoints. I found this particularly emotional and touched me deeply. So often we watch movies and documentaries as outsiders while the filmmaker covers a subject and offers insight and information. 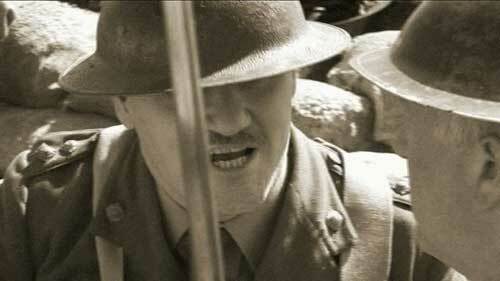 But by focusing on some of the soldiers it brings the whole film to life and makes it so much more real. It amazes me that we can keep having wars in this world when all they amount to are tragedy"
"The first section of this World War I docu-drama focuses on the South Africans who fought in the 9th Scottish Division and were massacred in Northern France. It's told with an interesting mix of actually footage, reenactments and present-day tour/commentary at the exact European locations. The butchery of battle is all too evident, as well as the incompetence and callousness of Allied leadership. Even after nearly 100 years, this war still has the capacity to make people angry at the incredible waste. The second section, called "A Soldier Returns" visits the battle from the point of view of some of the Scottish soldiers. It includes the touching, tragic story of Lance Corporal Robert Beveridge, the last part of which is told in a sort of "radio play" style. I found the film very compelling, especially its emphasis on individual soldiers. If you don't know any history of World War I, this presentation might seem a little disjointed, but if you have some background, the style of this documentary definitely brings the war to life." The Battle of Arras is one of the lesser known battles of WW1, it was intended as a diversionary attack to tie down German troops to enable an attack by the French to the south. It started on the 9th April, 1917 after an immense artillery barrage, the allies with Scots troops to the fore made huge advances on the first day, and the Canadians were entrenched on Vimy Ridge. Casualties had been significant but morale and confidence were high. The weather however was appalling with high winds, snow, sleet and sub zero temperatures. Following the initial success, indecision set in and there was great difficulty in maintaining momentum, supplies and heavy equipment were almost impossible to move. To add to the men's discomfort many have no greatcoats to wear, a result of an order by 3rd Army Commander General Allenby, or the Bloody Bull as he was known to his men due to his disregard for casualties and dreadful temper. The advance of 3rd Army reached the small village of Fampoux, a few kilometers east of Arras, the village of Rouex lay a km or so to the east, in Rouex the Germans were allowed to rally and the allied armies would suffer a heavy price, on the 10th April Rouex was there for the taking, it was lightly defended but a combination of poor communication, bad coordination and a lack of guidance from the top lead to a day of 'navel gazing' as it was know. 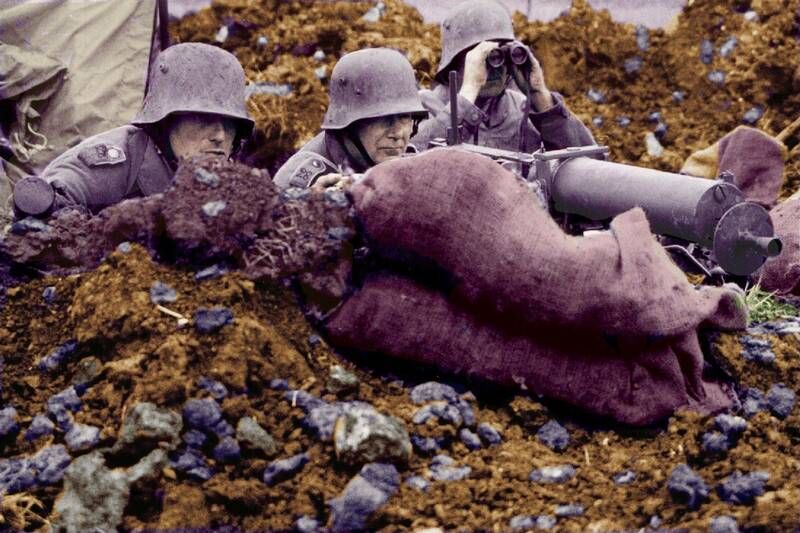 The Germans took maximum advantage of this lull and rushed many men forward who had been far to the rear and made Rouex with it's infamous Chemical Works (a sugar factory) in to a fortress which would prove a hell on earth and fighting here would rank amongst the bitterest of the war. On the evening of the 10th April, frustrated by the lack of drive of his troops, General Allenby issued a famous, now infamous, order to his troops. "The Army Commander wishes all troops to understand that Third Army is now pursuing a defeated enemy and that risks must be freely taken. Isolated enemy detachments in farms and villages must not be allowed to delay the general progress. Such points must be masked and passed by." Allenby was a very arrogant man, who had little compassion for his men and thought even less at times for their fighting abilities, complaining they were like frightened kittens hiding behind artillery barrages. The men of 3rd Army would soon find out exactly what the 'defeated army' facing them was capable of. On 11th April, hastily prepared orders were sent forward to the commanders of 4th Division, which still contained some pre war regulars in their midst, professional soldiers. "On April 10th the 10th Brigade received orders to attack the Greenland Hill position the next day. April 11th was a snowy morning. A conference of commanding officers was held at 2.30 a.m., to settle details, and at 9 a.m. the Fusiliers left the Brown line and proceeded to their position of assembly, a sunken road running north and south and situated to the north of Fampoux. This movement was complete by 11 a.m., but, unfortunately, it was observed by an enemy aeroplane, and the Position was heavily shelled. The objective allotted to the Battalion was about 520 yards of front, and included the Chateau south of the famous Chemical Works, and passing north across the railway to a cross-roads 250 yards north of it, This involved an advance of over 2,000 yards. Lieutenant-Colonel Incledon-Webber disposed his companies as follows :“ D ” Company on the right, “ C ” Company on the left, “ A ” Company in support, “ B ” Company in reserve and carrying company; he also had one section of a machine-gun company attached. The and Battalion West Riding Regiment were on the right and the Seaforth Highlanders on the left. At 12 noon the action commenced, and the troops advanced with great gallantry, but were at once met with heavy machine-gun fire from the north, south, and the buildings at the Chemical Works. 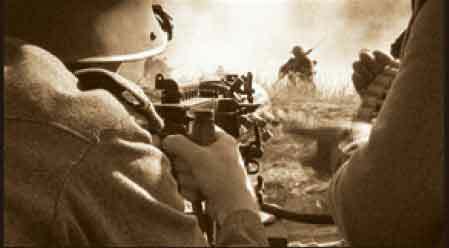 In spite of losses the attackers pressed on, and one platoon of 'D' Company succeeded in getting within 2oo yards of the Railway Station, but as their officer was wounded, and the 12th Brigade on the right were unable to advance, they withdrew, and, with some men of the West Riding Regiment, established themselves in a trench about 6oo yards short of the objective and.just short of the railway, the embankment being manned and used as a defensive flank. On the left, “ C ” Company did not succeed in advancing quite so far; they suffered severely, and Captain W. A. Verschoyle was killed, whilst gallantly leading a bombing Party, in an endeavour to put an enemy machine gun out of action which was holding up troops on our left.All the officers of the two leading companies having become casualties,Company Sergeant-Major R. Neville took command, established the line, and got in touch with the units on his flanks. Captain H. A, MacMullen, M.C., commanding “ A ” Company, although wounded early in the day, refused to leave his company until 12 midnight an act which was typical of this excellent officer’s conduct at all times of stress and danger. The Battalion lost 11 officers and 307 other ranks during the action. So soon as it was known that the attack had failed, a further attack was ordered for 3 p.m., but the orders to the artillery did not reach them in time, so it did not materialise. They marched into the village of Fampoux where they were to form up in the sunken road, unfortunately for them the road was not completely sunken. They were seen immediately, probably by spotters from the German 31st regiment who have climbed a 60 foot chimney, or by a German recce plane that had registered them. They were subjected to long range machine gun fire from the Chemical Works and when they were joined by the RIF in the road they were shelled. After what seemed an eternity they were off showing great courage, presenting as perfect targets to the Germans, silhouetted in their khaki battledress and Mackenzie kilts against the snow. Artillery had been scheduled to support them, but from the off it was of absolutely no value to the woefully exposed men. It did not land on the Germans at all and not a shell was seen to land in the Chemical works. Despite the apparent futility of the action the men of the Seaforth Highlanders and the Royal Irish Fusiliers pressed on against 30 machine guns, in a display of extraordinary courage. Leading a party of Seaforths was Lt Donald Mackintosh , a young lad of 21 from Glasgow and a former pupil of Fettes College, Edinburgh. He lead his men on to within a couple of hundred yards of the railway station, driving the Germans before them . How they ever got there, god only knows. Donald Mackintosh was wounded in the leg and rallied his men in a captured trench, they were countered attacked repeatedly and he was wounded again rendering him unable to walk. Crawling from the trench he urged his men to attack again where he was hit for a third and fatal time. His men fought on to the last man and the last round, cut off and alone, they died were they stood. For his gallantry Donald Mackintosh was awarded the Victoria Cross, his body was later recovered when Rouex was taken and he lies at rest in Brown's Copse Cemetery on the outskirts of Fampoux. "The total losses sustained by the battalion were 12 officers and 363 other ranks out of a total of 12 officers and 420 other ranks who took part in the attack. I leave these losses from to speak for the gallantry of all ranks." From the Hyderabad redoubt there could be seen a long row of dead Seaforth Highlanders cut down like grass by machine gun fire. The Royal Irish Fusiliers fared no better and suffered similar casualty levels. General Lambton was furious at the failure of the attack, but then he did not have to face the enemy, he accordingly ordered the Seaforths to attack again, but by then the 2nd Seaforths no longer existed, 93% of the battalion, including all their officers, lay dead, dying or wounded on the field. It is said the Regimental Sgt Major wept when he saw what happened to 'his laddies'.